I can't see how this is in any way similar to the ban on your books. This psak is in accordance with many gedolei haposkim, and it is surely legitimate for the Rabbonim of a kehilla to uphold certain halachic standards. Do you disagree? Just be thankful that you're Natan now and not Nosson anymore. I doubt this is legit. I have never seen it in Lakewood and there are no real signatures. And if it is legit -- it is not new. Look at the the date/parsha signed -- not recent. At least this one makes some logical sense. Is this a new thing, or have they been talking about it for a while now? And why now? Stockings are hardly new. Well, I never heard of the word denier, but now thanks to these rabbanim I'm well informed. I honestly don't understand how these rabbanim aren't embarassed to have such intimate and detailed knowledge of women's stockings. If I had such knowledge, which I don't, I would never admit it to others. It almost makes me blush. Are you trying to "make fun" of this ban? Or just trying to lament the state of bans in the CJ community? I ask people, especially the first commentor, not to make assumptions about what I think. I'm not. Thats why I'm asking. I echo, R. Waxman, I don't see what is "new" about this. Furthermore, it seems to me a little obvious that such stockings would be problematic to poskim who prohibit exposing the lower leg. And the only way to stop speculation (or at least minimize it :) ) about your opinion is to state it. 1. in the form of a ban, rather than a psak- not willing to recognize that there might be other opinions, which the people selling this product might rely on to make a living, and might not be the terrible people they claim. They make it seem as if there are no heterim, no other opinions. 2. without stating any reason or sources for the psak. in this way, no one can argue on them, because it's not an issue of who's right regarding the halakhic sources, rather who's a bigger rabbi. one says yes, one says no, but the substance is not the issue (and rarely do they say yes). this is exactly the game that they're playing, and it's been seen a lot recently- delegitimatizing other opinions, simply by a proclamation and not by halakhic reasoning. It's ironic that the guardians of conservatism in Judaism have decided on such a radically new approach in order to accomplish their goals. I agree with Jeremy. By taking something that is a matter of legitimate dispute among poskim and those who follow them and casting it as something that is unanimous; and labeling those who sell these stockings as machtiei harabbim; and saying that only is certain other colors (not including the listed ones) one should consult a posek, they are entirely closing off discussion and delegitimizing and slandering a whole group of people. I once asked my rebbe, Rav Ahron Soloveichik zt"l, about the parameters of tzniut. He told me that beyond the objective parameters of erva, a community, whether through the consensus of its people or through the opinion of its leadership, has the right to impose stricter standards as they see fit or needed, even if these stricter standards are mutarim al pi basic halacha. He further said that one who goes to visit that community, must dress in accordance with their stricter standards; if one doesn't agree with them and will not accept their standards, then don't go visiting there. The p'sak halacha that NS brought here was signed by the entire leadership of the Lakewood community. They have every right to do so, al pi halacha, and they have every right to encourage their community not to support what they see as a problem. If one disagrees, then fine, she shouldn't visit Lakewood unless dressed in accordance with their standards, and he shouldn't be selling the sheer stockings in the Lakewood community. This p'sak was not issued to Brooklyn, Passaic, Chicago, LA, or anywhere else; if it were, then as per the usual practice, other poskim from outside of Lakewood would have been asked to sign the p'sak as well. I don't understand the problem here. Since this website, which is about "rationalist Judaism" is now a source for the latest local piskei halacha, I hope we can expect future citings about what the leadership of Williamsburg, Boca Raton, Boro Park, and West Palm Beach have to say on a host of issues. Rationalist Jews obviously need to know! "Well, I never heard of the word denier, but now thanks to these rabbanim I'm well informed. I honestly don't understand how these rabbanim aren't embarassed to have such intimate and detailed knowledge of women's stockings. " There are no signatures and it is not on stationery. I also wonder, with Moshez, whether it is a real "ban." Can this be verified? I googled around and found that, somewhat peculiarly, the blogs that discuss this poster say that it has been seen around Brooklyn. They make no mention of Lakewood. Wouldn't one expect a ban by the Lakewood poskim to be up primarily in Lakewood? Has anyone in Lakewood seen this poster? This only adds to my suspicion that it's a hoax. You make a good and valid point. The Lakewood rabbinic leadership have every right to guide their community in a way they see fit. The problem is that they call this a "Psak Halacha". The way to write piskei halacha is not the same way that we write decrees. It is called a psak halacha but it is written in the form of a decree. So, what difference does it make? The difference is whether we, who do not live in Lakewood, have to consider this or not. We do not have to consider decrees made for the Lakewood community, but we do have to address piskei halacha. But there is no way to address this psak halacha because no proofs are brought, no arguments are made. In short, very frustrating. Would you have changed rabbis if your rabbi was Rav Ada bar Ahavah? 1. Rav Ada bar Ahavah once saw a woman wearing an immodest garment; he assumed that she was a Jewess and ripped it off of her. It turned out that she was a Nochris; he had to compensate her with 400 Zuz. Would you have blogged about it (assuming blogs existed at that time)? 1. It is completely legitimate for the leaders of a community to dictate standards to that community. If the members of the community can't tolerate it, they should leave the community! 2. The community whose Rabbonim are represented hers is Lakewood. So why is the flyer being posted in Brooklyn? Since when is a psak by Lakewood Rabbonim binding on Brooklyn? It is troubling that there is no hint in the letter that it is a community-specific ruling. Or do they really think that this is what has been halachically correct in all places and in all times? 3. The letter makes the very reasonable point that, given that bare skin is forbidden in these communities, stockings that resemble bare skin should also be forbidden. But this begs the question that this is not the standard with sheitels. Why the difference? 4. 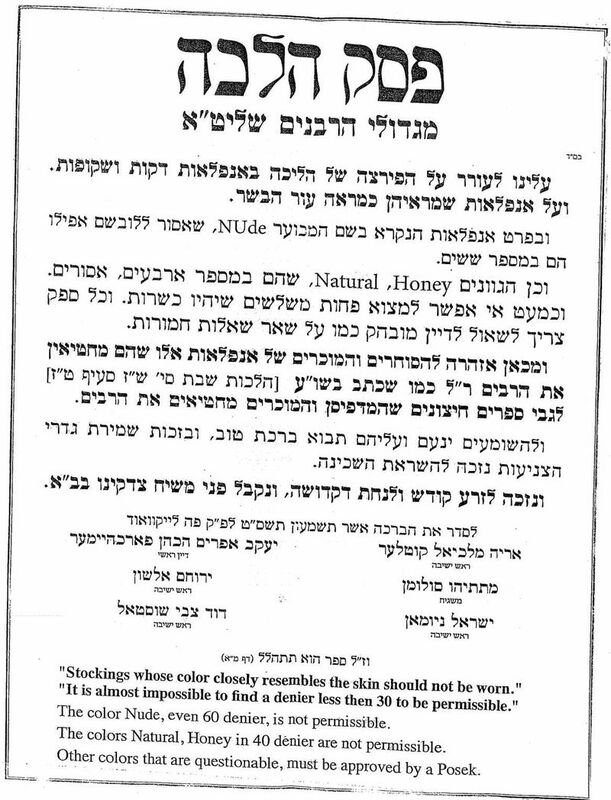 The whole concern here is tzniyus, and yet I find the flyer itself to be very untzniyus, with rabbonim publicly discussing the intricacies of women's hosiery. Is that because I am British and prudish? Sorry, this is ridiculous. Don't you ever take your wife's underwear to a Rav? What could be less tzniusdig than that? That said, the idea of banning anything by way of posters is totally absurd, and clearly demonstrates the deterioration of Rabbinic leadership and authority and of a normal Jewish community in general. Why can't anyone who is concerned about the issue just ask their own Rav? I'm sure this is why RNS brought this here. That's also not great, which is why ideally, people should be able to pasken themselves. But there's a huge difference between a private conversation and a public poster! You think that putting women's underwear up on posters would not be endorsed by these rabbis? That's also not great, which is why ideally, people should be able to pasken themselves. I'm not sure if this is why "people should be able to pasken themselves", and in any case, there will always be many who won't be able to. The original objection was to "intimate and detailed knowledge", and this is just wrong. The Gemara and poskim are full of such knowledge (some of it even scientifically correct). Knowledge in and of itself is not a violation of tznius. But there's a huge difference between a private conversation and a public poster! This poster reminds me of the letters we used to get from my girls' school: Dresses should be at least 10 cm below the knee but at least 10 cm above the ankle, etc. My wife aptly said that girls need to have a feeling for what is tzanua and what is not. I am sure that you can follow the letter of this poster and still not be dressing in a modest manner. It's difficult to put tznius into a formula of so many millimeters thickness and so many centimeters length but you can do this and not be dressing modestly. It's something which needs to be ingrained in the way people dress and act in schools and if the stress is on the number of centimeters below the knee and on the thickness of the stocking in millimeters, G-d help us because this is not chinuch for tznius. Rabbi Slifkin -- this poster is more than likely not legit. I live in Lakewood & have never seen it & Rabbi Forscheimer is never called dayan rashi. "Unfortunately they have become a target of much mockery as a result of these knee jerk actions. Very sad..."
A major question, then, is should the bans themselves be "banned," due to the resultant disgrace to Torah that's engendered? If these Rabbonim are seen by the public at large as the "face of Torah," expressing their views in a fashion that elicits mockery brings shame upon the Torah itself, and (arguably) leads to denegration of Torah study in general. "It's something which needs to be ingrained in the way people dress and act in schools and if the stress is on the number of centimeters below the knee and on the thickness of the stocking in millimeters, G-d help us because this is not chinuch for tznius." "All too often we have justified our reluctance to actively help our children cope with their emerging sexuality by raising the banner of tziniut. With this convenient shield, we have protected ourselves from our own discomfort." He stresses the need to deal with natrually occurring, " attitudes and feelings, doubts and anxieties"
See as well this article by Rabbi Simcha and Chaya Feurman in article in the Jewish Press about clarity in appropriate communication and "not reinforcing an unhealthy degree of shame"
2) There was an article in Binah (Hamodia)Magazine which made the point that proper and appropriate discussion should lead to elevated and inspired communication between parent and child(or, one might add, between Rebbe and talmid). In keeping with the elevated nature of the topic described by Binah, I ,similarly, have tried to frame the points I raise here not as an attack on the Right Wing, but in a positive, productive manner. > Rav Ada bar Ahavah once saw a woman wearing an immodest garment; he assumed that she was a Jewess and ripped it off of her. It turned out that she was a Nochris; he had to compensate her with 400 Zuz. Of course I would change rabbis. This doesn’t even make sense. She wasn’t dressed tzniusly, so he tore off her clothes? Being naked is more tznius than a short skirt? And anyone who would attack a woman in the street because he doesn’t approve of the way she’s dressed is a hooligan and should be arrested for battery. The last post (G3) shows everything that is wrong with your entire pseudo-rational approach. Real rationalists would have looked up the gemara, and would recognize that we are talking about people here (Rav Ada bar Ahava and the others mentioned in the gemara in Brachos) who were not only infused with the wisdom of Torah, but whose lives were defined every second by Torah. To wit: the gemara in Brachos retells a group of sages asking why the earlier generation merited a special degree of hashgacha pratis that the current generation did not have. The answer given was that the earlier generation gave over their very lives for kiddush Hashem. By way of example of that notion, Rav Ada bar Ahava saw a women whom he thought was Jewish, wearing a red head covering (which was viewed in those days as being immodest). He tore it off of her. When he found out she wasn't Jewish, he voluntarily paid her an exorbitant amount of money and regretted what he did without investigating whether she was Jewish first. You'll notice that the gemara doesn't criticize him for tearing off the head dress had she been Jewish. Apparently, that would have been the proper thing to do. We can propose that in the time of the gemara, in the culture of the Jewish community, such a stark act would have had the desired shocking effect of correcting the people's view about wearing these immodestly brightly colored garments. The criticism was that he Rav Ada didn't check first if she was Jewish, for which he did teshuva. G3 has the gross chutzpah to call this "hooliganism" without checking what happened? About one of the baalei hamesorah and sages of Israel? Who himself was lauded for his kiddush Hashem? You are mistaken in thinking that the gemara is suggesting that this be done in all circumstances no matter what. The gemara is NOT saying that! What was fit for that circumstance my NOT be fit for today. 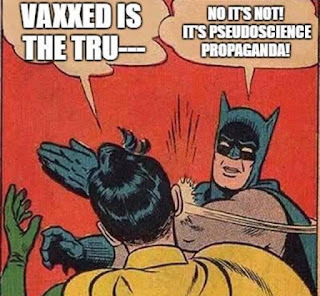 Please....learn a little before lashing out due to your own ignorance! And NS should be criticized as well for posting this vile comment without putting the gemara into context right away or correcting the harsh reaction and gross ignorance. This is rationalism?!? Rav Ada did teshuva...so should you. "he voluntarily paid her an exorbitant amount of money"
Please don't confuse "beg the question" and "raise the question." Begging the question is a variant of circular reasoning. Raising a question is when a question is implicitly brought up. JW - you're right - I meant to write "willingly" (not voluntarily), as in, he willingly paid the money while acknowledging his mistake. That's at least part of the reason that the gemara cites him as one who sacrifices for kiddush Hashem. i think the idea that he felt "bad" about it may also be reading ourselves into that gemara. yes, one could say that it is "part of the reason", but the only reason one is compelled to say "part of" is that there is an obvious other component, which is clearer. how do we know that he even "willingly" paid this money? this was imposed upon him by the non-Jewish government. it is not like he had a choice! it was likely an instance of pay the fine, or else face imprisonment. and the conclusion of the gemara is that her name was Patience, and he said "Patience, Patience, here is 400." מתון מתון. (patience/200). Had he been patient, he would have saved 400 zuz. This does not strike me as *necessarily* tearing keriah for having so assaulted a poor gentile woman. rather, it strikes me more as feeling sorry for himself after the fact for having to pay such an exorbitant fine. it *could* be seen as Divine justice, but equally could have been seen as an unfortunate natural consequence of his rash actions. what are we to do with the gemara? i think there are answers. certainly we should not, on the basis of this, think that the actions of the bleach-throwers are correct. because what is proper in Persia in the time of Chazal may well be improper nowadays, much as we differ in attitudes towards slavery and polygamy. no one should do as rav did, as he traveled from town to town. (if we take it without the teitching up.) and no one should act as rav huna, cutting off hands. i think we can even read into the gemara there, that this was one generation looking admiringly at an earlier generation. that is, there was not the danger of people following in Rav Ada's admittedly rash actions. they might well have a different attitude were Jewish women daily assaulted like this. similar to how rava says in ketubot daf 62 how in terms of how long one may not visit one's wife while off learning Torah, many in rava's generation tried to do like rav ada bar ahava's position and suffered for it. also, R' Shteinsaltz says (and is perhaps preceded by others) that it was a shaatnez garment. in which case applications to tznius need not necessarily apply. Would you have blogged about it (assuming blogs existed at that time)?" ... I was more interested in hearing answers to my second question than my first. Does anyone know for sure whether this poster is real or a hoax? Natan, where did you find it? "1. It is completely legitimate for the leaders of a community to dictate standards to that community. If the members of the community can't tolerate it, they should leave the community!" Awesome! Thanks for letting me know that leaving the community is exactly what halacha wants me to do. I'll share this with my fellow off the derech women. If we cared what the halacha is, I'm sure we'd find it very edifying to know that what the community really wants is for us to leave. Fortunately, I jumped the gun on this one by leaving several years ago. I have several reasons for believing the flyer is real. 1. The copy posted here looks like the one posted on the failed messiah site by Shmarya Rosenberg who claims he got it from a friend in Brooklyn who has seen it staying up in many locations. He surmises that if it was a fraud it would have been removed. 2. I wrote a satirical piece, "Stalking the Stocking: The Lakewood Lingerie Law" on my blog. While a number of folks have asked is the ban for real, no one has pointed to anyone authoritative anywhere in the Orthodox world who has disputed the truthfulness of the dissemination of the ban. Nor for that matter have any of the unofficial/official outlets like vozineiyas, hamatzav, or yeshivaworld disputed it. On several forums devoted to tznius I saw a lot of new discussion in the past few weeks about stockings. No one suggested the ban was fake. Do we have proof. No. How can you with a ruling body that has no official register of advisories, nor a website, etc? We have entered a realm of charges by unknown figures with potential conflicts of interest, who get rulings without a presentation by the other side, signings by others who did not consider the issue on their own, and then publication by poster with no elaboration of reasoning. They use procedures that invert the classic procedure of the Sanhedrin, where the most junior members spoke first so they would not be intimidated. Now the senior figure signs on the basis of a presenter and the juniors all fall in line without independently evaluating the evidence. So I would say, yes, I am pretty sure the flyer is for real, though it may or not have grown out of reasoned decision making process. To me the interesting part is the scope. They make no mention that this is strictly an advisory to their own community and those that follow its standards, though obviously the signatories are all the key figures of BMG and only BMG. "we give notice to merchants and sellers of stockings that they lead the public to sin, have mercy on us (as is written in the codes) regarding outside books that they print and sell which lead the public to sin." How far off is my translation? If it is on, what does that tell us about the politics of this ruling? I applaud your pluralism when you speak of a right for the rabbis of a community to set their own standards. But the flyer could easily lead one to conclude this is halachah. While halachah does not ban bare skin when a the skirt is long enough we think it would be desirable to always wear stockings because ... In our opinion this should be done by avoiding sheer stockings and instead. . . However we caution all of our kehillah to not suspect or accuse others who do not adopt this practice. Klall yisroel is governed by one halachah and we do not want to fragment our people by implying that those who do not adopt our stringencies are not halachic.